When people pick up a copy of my chapbook, The Stolen From, or of the anthology I edited, Forgetting Home, their natural assumption is that I have first hand experience of the nightmare that is losing a loved one to this hateful condition. But that is not how these two books came about. The truth is that in May 2011 I received a call from an association called Arts Horizons of New Jersey, asking me if I would be interested in running poetry workshops in a group home for older adults living with Dementia and Alzheimers. Although I didn’t have the first clue what this would entail, I agreed to give it a try. Over four years later I have visited the home, CareOne in Moorestown, almost every month and while I wouldn’t call what I do there poetry workshops exactly, I’m certainly working with poetry and Alzheimers. Organizations such as the Alzheimer’s Poetry Project have long recognized that poetry is an exceedingly useful way of connecting to the memories of a person suffering from Alzheimer’s disease. The fact is that the memories we lay down in our childhood and teenage years are among the most resilient, and for many of us that is when we are having poetry read to us in elementary school, or studying poetry in high school. The act of being able to remember such well-known poems makes residents feel empowered and gives them some semblance of normality. But poems don’t have to be famous to help these older adults connect with their memories. What I typically do at the beginning of each session is read 4-6 poems written around a similar theme. Then I use that theme to attempt to draw out recollections and stories from the older adults listening to the poems. At a training session given by the National Center for Creative Aging I learned how photographs could be used in this way, and it seemed to me that poetry could be equally as powerful. Themes I have used include the various Holidays (Christmas, Thanksgiving, 4th of July, Veteran’s Day, Mother’s Day, St. Patrick’s Day etc. ), seasons, places, food, schooldays, careers, and so on. Sometimes, the theme successfully generates quite long recollections which I honor by writing down. Sometimes I have to prompt recollections by asking open-ended questions e.g. “How did your family celebrate Halloween?”, “What career or jobs did you enjoy doing most?” “What did you like best about the New Jersey shore?” Again, I honor the memories by writing them down. 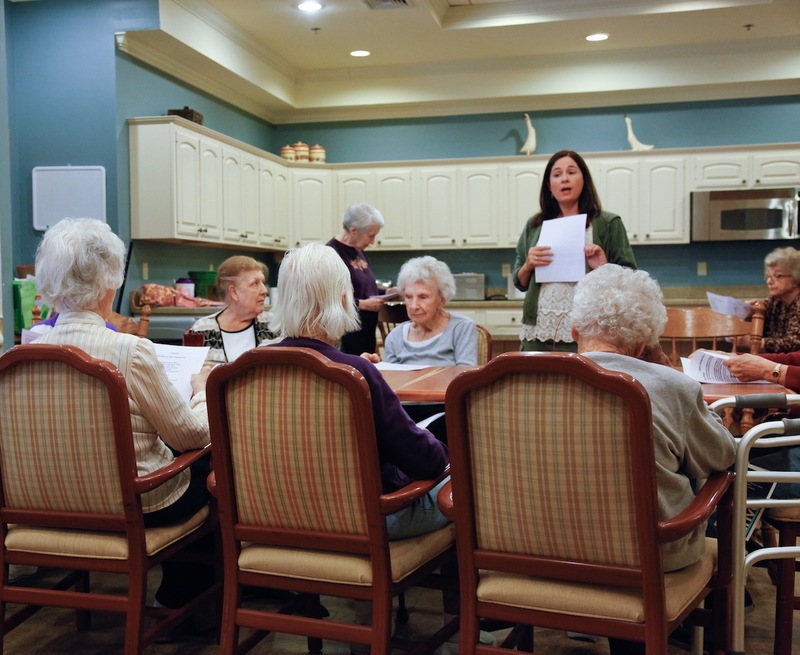 Sharing their own stories bolsters the residents’ sense of identity and self-esteem. Being involved in the discussions makes them feel less isolated and generates a sense of well being. The Acrostic — For example, if our discussion has generated a list of careers/jobs the residents enjoyed (Secretary, Teacher, Realtor etc.) I write the word vertically down the page and encourage them to call out words or phrases for each letter that describe someone who might have that career. Haiku — I don’t insist these be 5-7-5 syllables, just that they make a short-long-short pattern on the page. These can often be constructed directly using the memories written down earlier. Monorhymes — The capacity to generate rhymes for a given word is unrelated to memory. I give them a word and collect suggestions for rhymes, then we write the poem and try to use as many of the suggestions as possible. 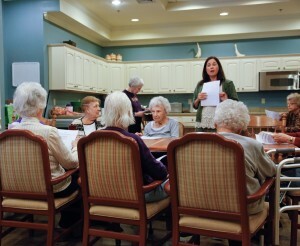 Participating in a creative/intellectual exercise gives the residents a sense of accomplishment plus they have fun! 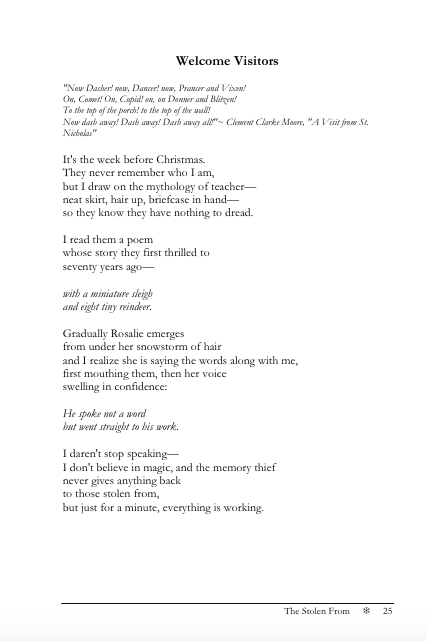 So, the workshops inspired me to write poems about my observations, and I decided to self-publish these as the chapbook, The Stolen From, plus the experience gave me a connection to Alzheimer’s, and I decided to do what I could to help alleviate the suffering by publishing the anthology Forgetting Home. Meanwhile, I still go along to CareOne every month, where some of the residents have been there since I started. They may not be able to tell you my name, but they do know that they enjoy what we do.